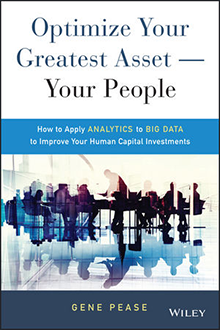 Gene’s book provides a proven framework for optimizing human capital investments through predictive analysis. This book will help you transition from anecdotes and surveys to more advanced measurement techniques, and combine the data from multiple systems into a unified plan of action that improves business results. The book includes practical examples and case studies on the application of these techniques in real-world settings and features interviews with thought leaders from McKesson, Xerox, Chevron, Wells Fargo, and others. It covers the latest research on the state of current HR measurement techniques, and the important considerations surround data security and employee trust. This book will show you how to bring that data together, organize it, and turn it into useful information, and how to build your data strategy to take advantage of the wealth of available tools. It’s time for HR leaders to get over their fear of Big Data. Good data drives good business, and human capital is the biggest asset a company has. Start measuring the things that matter, and start turning those measurements into actual information that goes beyond the spreadsheet. Optimize Your Greatest Asset — Your People shows you how to get started, and where to go from there. Read free instant preview and buy on Amazon. Gene’s second book is also featured in The Wiley and SAS Business Series, a series of books that help senior-level managers with their critical management decisions. Developing Human Capital: Using Analytics to Plan and Optimize Your Learning and Development Investments provides a guidebook for collecting, organizing, and analyzing the data surrounding human capital so you can make the most of your employees’ potential. 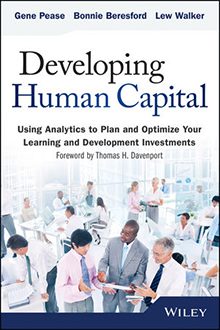 Developing Human Capital: Using Analytics to Plan and Optimize Your Learning and Development Investments includes a foreword by Thomas H. Davenport, and is co-authored with Barbara Beresford and Lew Walker. 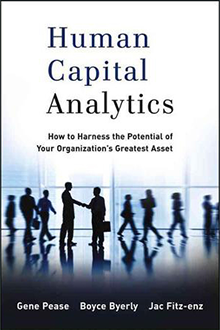 Human Capital Analytics provides an in-depth look at the science of human capital analytics, giving practical examples from case studies of companies applying analytics to their people decisions and providing a framework for using predictive analytics to optimize human capital investments. The featured case studies are from Lowe’s, Rio Tinto, Sun Microsystems, U.S. Bank, Chrysler, VF, and ConAgra. Gene’s first book, co-authored with Boyce Byerly, and Jac Fitz-enz, Human Capital Analytics provides essential action steps for implementation of advanced analytics on human capital. This book is featured in The Wiley and SAS Business Series, a series of books that help senior-level managers with their critical management decisions.